February 1921 found the 1st and 2nd Battalions widely separated the former being in Egypt and the latter in Ireland. Peace-time conditions were increasingly returning swords were to be worn from 1st April 1921 and officers were to be in possession of mess dress by 1st January 1922. Queen 's Cup Team 1901-2. Pte Hyson, Lt Murray, C/Sgt Browne, C/Sgt Barley. Sport was adversely affected by moves. Some local football matches were played in Egypt, results being:- 208 Squadron RAF - won 2 - 1, 208 Squadron RAF - lost 0-3, 2/70 Burma Rifles - won 2-1, 208 Squadron RAF - won 5-3, 216 Squadron RAF - won 4-1. The Cross Country team were successful in the Group Cross Country Race thus qualifying for a team to run in the Egyptian Command Championship to be held later. A Boxing Tournament held on HMT Main and open to all on board resulted in:- Middle-Weights - A B Smith, HMT Main beat Dmr Gibson. Welter-Weights - Pte Chance beat Steward Kelly, HT Main. Light-Weights - Cpl Smith beat Pte Billingsley, Feather-Weights - Pte Jackson beat Pte Eades. Bantam-Weights - Pte McClean beat Asst Cook Nicklin, HMT Main Boy's Class 1 - Boy Wareham beat Boy Johnson. Boy's Class 2 - Boy Baker and Scott - Draw Boy Leavey beat Boy Smith Middlesex Regiment. Prizes for "good losers" went to Ptes Broughton, Newson, Murphy and Boys Wood, Major and Briffett. Some inter - company sports in the form of boxing, football and cross country running took place in the 1st Battalion during this period. 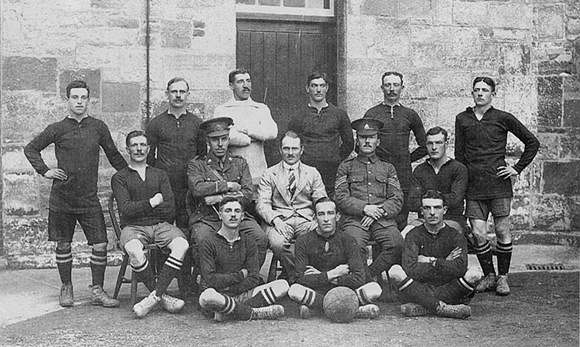 The 2nd Battalion in Ireland, despite the difficulties of the political situation, managed to play football in the Army Cup, defeating to 1st Royal Scots Fusiliers in the 2nd round but falling to the RASC, 2 - 1 in the 3rd. The Depot, at football had a run of successes, gaining various victories in:The Kingston and District League. The Surrey Junior Cup. The Chambers Cup. The Surrey Junior Charity Cup. The Surrey Mid - Week Cup and The 3rd Round Teck Cup. 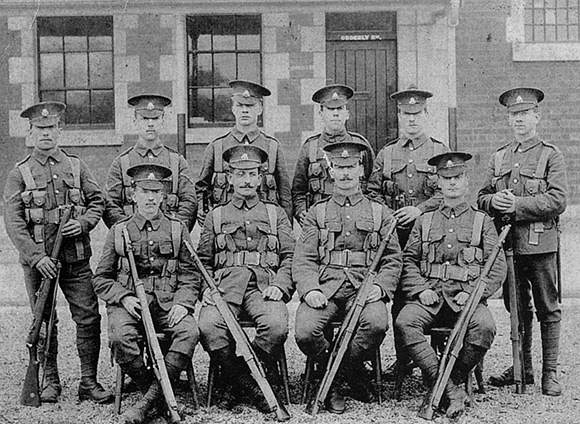 The Rifle Eight 2nd Bn The East Surrey Regiment. Winners of The Queen's Cup 1899. Sgt Instructor of Musketry Percy (winner of The Silver Jewel, Bisley 1899) Tashkighla Barracks. March the 1st Battalion, stationed at Ismailia, with detachments at Suez and Kantara, had success in shooting when the Hopton Cup of the Army Rifle Association was won by No 16 Platoon and C Company were placed 3rd in the Company Match. A football match against HMS Ceres in the same month was lost 4 - 3. A serious programme for Tug of War events was proposed and some minor competitions undertaken, D Company's Light-Weight team defeated a team from HMS Ceres by two pulls to nil. Goldsmiths & Silversmiths Cup, Officers Cup 3rd Prize, 10 Silver Medals, 10 Bronze and 159 Money Prizes. At a Battalion Boxing competition in February CSM Coomber defeated a Petty Officer of the French Navy in a hard fought contest. 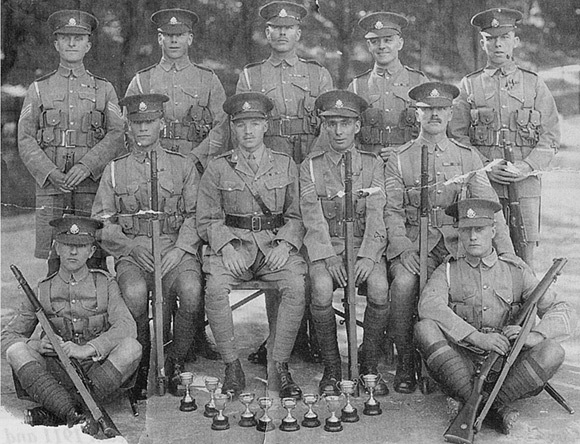 Other sports tended to suffer through detachments being absent on duties at Kantara and Suez although 16 Platoon, D Company won the Hopton Cup for shooting for the first time for the Regiment. The team consisted of Sgt (later CQMS) Hosmer, L/Cpls Gibbons and Griggs, Ptes Bayliss, Millard, Muscroft, Penfold, Ridge and Wilson. Further successes were obtained by D Company when they defeated three other companies at hockey. The 2nd Battalion, in Ireland, achieved initial success in hockey by defeating the 1st Battalion The Wiltshire Regiment in the 2nd round of the Army Cup but they were eliminated in the 3rd, Of importance to the Territorial Battalions of the Regiment was the fact that on 14th July 1921 proposals (later to become effective) were made to change the title of Territorial Force to Territorial Army. At the 2nd Middlesex Boxing Tournament held at Abbassia, and open to the Egyptian Command, the 1st Battalion won prizes in the Fly, Bantams, Feathers and Light-Weights Competitions and in the 6 Round contest Sgt Dr Lamprell beat Cpl Bristowe, 11th Hussars on points. The Battalion Tug of War Team (110 stone) took part in the French Sports held at Ismailia, defeating the 19th Brigade RFA by 2 pulls nil and 208 Squadron RAF also by 2 pulls-nil. In Athletics Pte Gurman won the open mile race held by the Egyptian Police (presumably not in an escape from custody). L/Cpl Neal, L/C Prosser, Pte Pearson, Pte Parry, L/C Healy, Pte Sparkes, CSM Toohey, Sgt Hunt, Cpl ? The 2nd Battalion in Ireland had little time for sport being heavily engaged in security duties arising from the current "troubles". 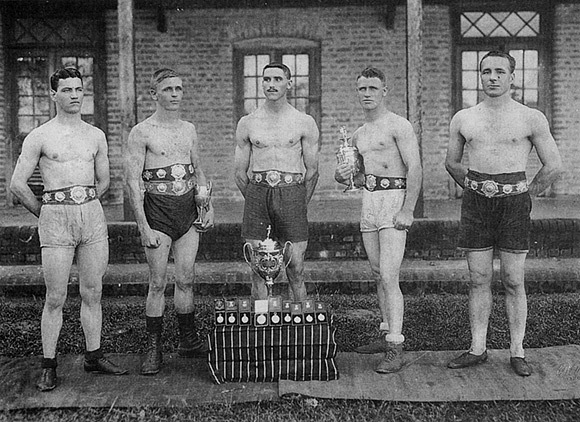 Some cricket matches took place, however, while at boxing Pte York was successful in the Bantam-Weights at the Dublin District Novices competition where he won a handsome Silver Cup. 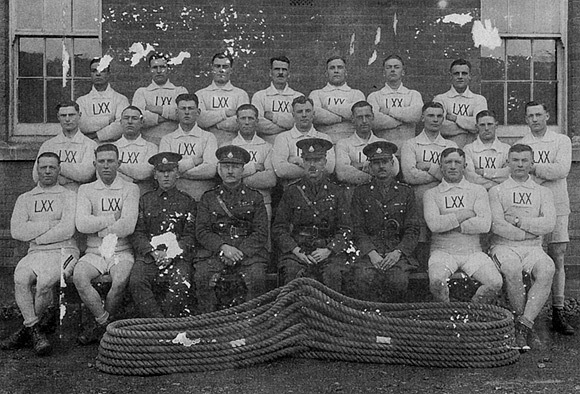 The 6th Battalion, in combination with the Depot, held a sports meeting on the Depot sports ground on 23rd July 1921. The Depot defeated the 6th Battalion in the Inter Unit Tug of War and Relay Events but in other open and inter-unit events the 6th Surreys achieved successes in the 100 yards, Half Mile, Mile (Open), High Jump, Long Jump and Band Races. Also in July Maj Gen Sir John Longley KCMG, CB presented the King's Colour to representatives of the Battalion on Wandsworth Common in the presence of a large gathering which included the Mayor of Wands worth and members of the Council. At Golf the Regimental Team reached the semi-finals in the Army Golf Championship but were beaten by the RAOC who were eventual winners of the Championship. The East Surreys team consisted of:- Capts Nicolls, Heales and Butler and Lt Crompton. A fair performance at cricket was made by the 1st Battalion. Of 25 matches played 13 were won, 2 drawn and 10 lost. An outstanding performer and Captain was Lt Allfree whose Century at Kantara against the strong Club team was acknowledged by many to have been one of the best ever seen on the ground. At a three day Boxing Tournament on 22nd, 23rd and 24th September 1921 victories went to the 1st Bn The East Surrey Regiment in the Feather, Light and Welter-Weights contests, Most interesting of the events was a six round contest between old adversaries Sgt Dmr Lamprell, East Surrey Regiment and Sgt Bristow 11th Hussars. In a previous match Lamprell had beaten Bristow on points but on this latter occasion Bristow took his revenge by knocking his opponent out in the 4th round. Inter Coy Cross Run 1912 Kinsale. E Company Winning Team 1911 and 1912, Moore Park, Dublin. Successes were gained at swimming at Cairo in October, The Battalion won nine prizes out of fifteen and by winning the Canal Zone Group Inter-Unit Competition qualified to compete in the Command Championships which were held at Alexandria on August 11th and 12th and which resulted in a win for the Battalion, The Battalion Tug of War team, of which eight were D Company men, defeated all corners in various competitions, Victories were also gained in cricket by the enthusiastic D men who triumphed in matches against the 5th Dragoon Guards and 39th Bty RFA. Still in Ireland the 2nd Battalion had a busy fixture list, competing in the Army Cup, the Irish Army Football Challenge Cup, Dublin District Knock-out, Brigade InterCompany Knock-out Competition and the Brigade Boys League. 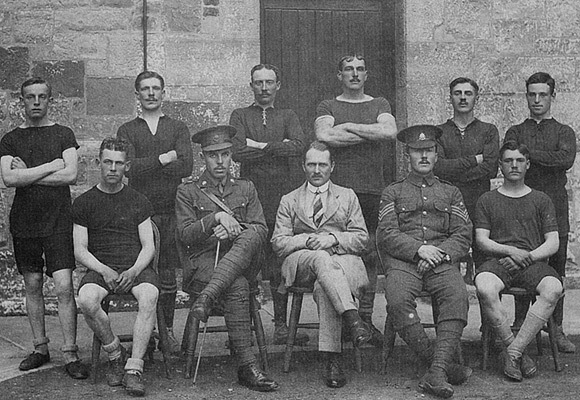 Sport generally suffered in the Battalion due to various moves of personnel but moderately good results were obtained in hockey and swimming while at shooting B Company did well when firing Table "A" at Kilbride. Their average was 130.4, there being 10 marksmen, 39 first-class and 10 second-class shots, Lt Adcock did some brilliant shooting, compiling a score of 180, the highest in the Battalion. Sgt C Clarke, Capt H P Torrens, 2nd Lt ?? The 1st Battalion left Ismailia for Kasr-el-Nil Barracks, Cairo. In a farewell speech the Brigade Commander, Colonel Commandant A L Lawson CMG, paid them great compliments and congratulated them on, among other things, their sporting achievements particularly in the sphere of boxing. 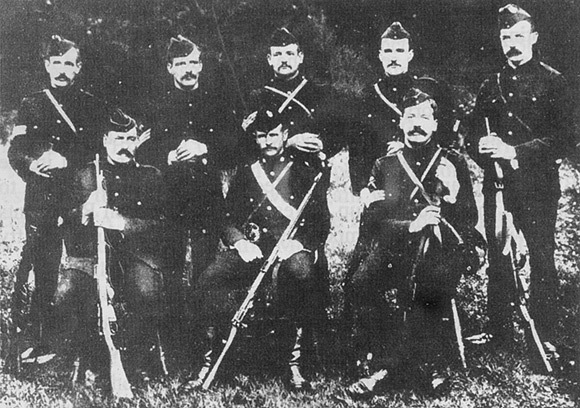 Strenuous training in musketry was undertaken and the Battalion entered for all available ARA Competitions both rifle and revolver. 10 Platoons fired in the Hopton Cup Match, 3 teams fired in the Company Match and Regimental Teams fired for the following:- King George Cup, Duke of Connaught Cup (revolver), Queen Victoria Cup, The Henry Whitehead Cup, The Revolver Cup. Shooting in all cases was reported to be of a high standard and results were eagerly awaited. 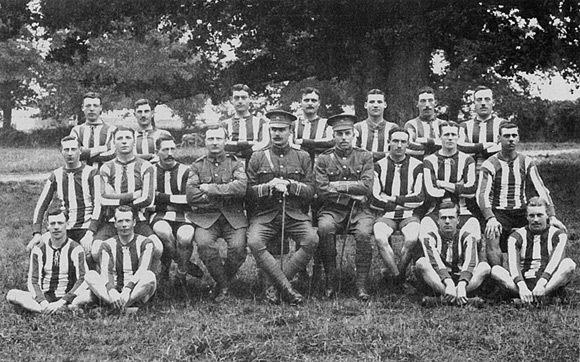 For the 2nd Battalion in Ireland there was the welcome news of the declaration of peace, resulting moves and transfers made resumption of sporting programmes difficult but reasonable results were achieved, The battalion hockey team entered for fixtures in the Leinster League, the Dublin District Military League and the Army Cup in which they lost to the 1st Bn The Wiltshire Regiment. Some strong opposition from civilian teams was encountered in the Leinster League while in the Dublin District Military League 14 matches were played of which 8 were won, 3 drawn and 3 lost. At football B Company won the Dublin District InterCompany Cup. In the 2nd round of the Irish Army Cup the Battalion lost to The 1st Cheshire Regiment while in the Dublin District Knock Out Competition defeat was inflicted on The Wiltshire Regiment 3-0 and on the King's Own 5-0 until succumbing to the 1st DCLI in the Semi-Final. In preparation for the Brigade Boxing Tournament a Regimental Novices Competition was held, resulting in some good contests. A redoubtable and successful fighter was Pte Parker who won a silver cup. He had three fights and in each case put his man out in the first round. A good shooting programme was maintained for the Musketry year 1921-22 with high hopes for a successful meeting at Aldershot later on. B Company won a cup presented by Maj Gen Boyd for the best Company Football Team. The Depot obviously had some good shots in their ranks as in various ARA Competitions in 1921 they achieved victories in: Queen Victoria Cup, First Army Cup, Company Match Hopton Cup, and acquired a total of 197 Silver Medals and 34 Bronze Medals. In the Annual Command Athletics Championships held at the YMCA Ground at Gezira on 13th April the 1st Battalion won the Tug of War Middle-Weight Challenge Cup by defeating the 2nd Bn Royal Munster Fusiliers. But the Fusiliers reversed the situation in the Catch Weight event to retain their currently held Championship. At Athletics the following notable successes were achieved:- 100 yards - 1st Lt Pope, 2nd Pte Cox. 120 yards hurdles - 1st Lt Pope. 220 yards (Enlisted Boys) - 1st Boy Hutchings. Long Jump - 1st 2/Lt Cope. The Football Team, after initial successes in the Command Championship were eventually defeated in the Cup Final by the Sherwood Foresters. Effects of post-war reductions of the Army were being felt in all aspects of Regimental life including sport but strenuous efforts were made to keep the spirit of things alive. The 2nd Battalion, back in Aldershot from service in Ireland in 1922 found that the "AXE" and drafts abroad had depleted their numbers considerably. They managed to continue shooting events in the Monthly Fire Control Competition and Pool Shots for March while at hockey friendly games were played against the 2nd Bn Royal Scots the 1st Bn Sherwood Foresters who were heavily defeated 9 - 2. In the first round of the Command Senior Knock-Out Football Competition the Battalion lost to the 2nd Royal Scots in the 1st Round. Better results were obtained in the Junior Competition where the semi-final was reached before defeat was inflicted by the Sherwood Foresters 2-1. On 9th June HRH The Prince of Wales visited Cairo on the return journey of his World Tour. The Battalion had the honour of providing Guards of Honour in connection with the occasion. He attended a Command Boxing Tournament at Kasr-e1-Nil where he received a great reception and presented the prizes. Battalion representatives in specially arranged contests were Sgt Dmr H Lamprell, Cpl W Smith and L/Cpl H Major. Cpl Smith won the Prince of Wales Cup by defeating L/Cpl Newall of the Royal Ulster Rifles in a three rounds contest on points. Shooting successes were gained at the Egyptian Command Rifle Meeting when the Battalion won the Challenge Cup for the best all round shooting unit. They defeated 2nd Bn The Highland Light Infantry by 8.5 points. Tragically, Pte Jenner of the Young Soldiers Team, died shortly afterwards. having suddenly been taken ill after dismounting from the Residency Guard. Lt Pope of C Company distinguished himself in the sporting fields by winning both the 100 yards and 120 yards hurdle at the Command Athletics Championships in April 1922 as well as winning the Officers Welter-Weight Competition in the Command Boxing Tournament. Obviously a good all-rounder he took the bowling honours in a cricket match in the InterCompany League. Rifle shooting at the Bisley ARA Meeting did not present the 2nd Battalion with much success apart from the fact that Maj Dowler finished second in the Roupell Cup, losing by only one point. Cricket was a more successful venture, the Battalion having played nineteen matches of which they won 11, lost 7 and drew 1. At the Aldershot Command Horse Show B Company Transport won the Infantry Transport Challenge Shield with turn-outs described as being "the admiration of everyone". They also won the award for the Best Pair of Mules in a GS Wagon and obtained 3rd place in the Heavy Draught Class. The King's Challenge Cup was lost to the Royal Engineers by only 2 points. 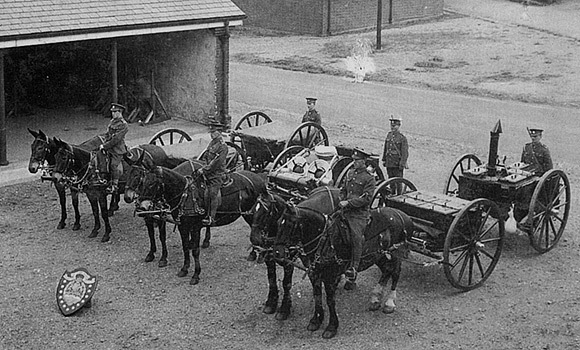 Infantry Horse Transport. Pairs of Mules (in GS wagons). 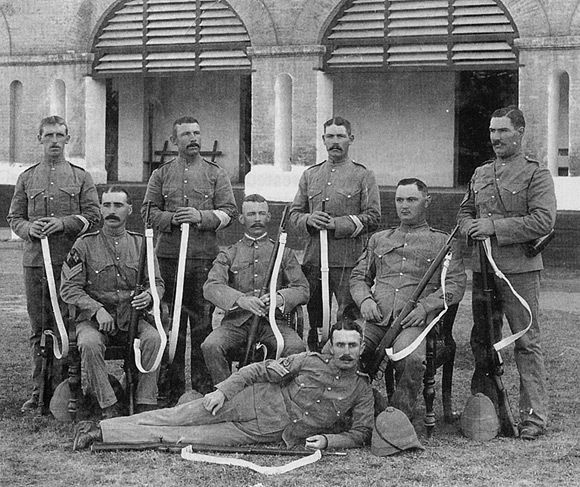 The 1st Battalion in Egypt received news from the Army Rifle Association (somewhat delayed for administrative reasons) that they had won the "Henry Whitehead Cup". This made five matches won by the Battalion in 1921 viz:- The Queen Victoria Cup, The Henry Whitehead Cup, The 1st Army Cup, The Company Match, The Hopton Cup. This was easily a record for any unit during the time the ARA had been in existence. The Battalion cricket team did not have a very good season. Out of 26 matches played they won 8, lost 11 and drew 7. Once more Lt Allfree was a distinctive batsman, scoring 111 not out in a match against the YMCA. Company-wise A Company had greater success - winning the Cricket Shield for the second year in succession. Aldershot Command Rifle Meeting 1923 2 Surreys. Major Dowler, Major Creaghe, Capt Voisin, Capt Clarke. An up and coming boxer was Boy Baker who won the Boys Command Championship in Egypt and was presented with a medal. The 2nd Battalion in Aldershot had a reasonably successful cricket season despite a cold and wet summer. Of 28 matches 13 were won, 11 lost, 1 drawn and 3 abandoned due to rain. A Company won the AAR Inter-Company Cricket when they defeated the 2nd Bn Royal Scots by 87 runs. The Football team produced only average results collectively but a good player individually, L/Cpl Mason, their centre forward had been selected to play for the Army on several occasions, scoring two goals in the Army v Aston Villa match. 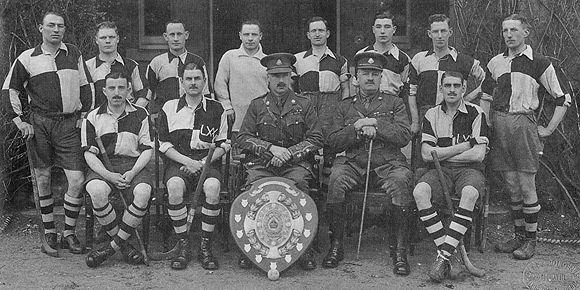 Distinction was gained on the hockey field when the 2nd Battalion won the Aldershot Command Hockey Championship, 1922-23 and were semi-finalists in the Army Hockey Cup 1922-23. 1923 saw many changes due to postings and discharges. 2 Surreys. Winners and Finalists, Aldershot Command Tug-of- War. Successes were gained at the Egyptian Command Individual Boxing Championship held at Cairo on 1st , 2nd and 4th December 1922. Winners in the Officers Classes were:- Light Heavy-Weights - Lt A E Cottam MC. Middle-Weight 2/Lt E A S Cope. Light-Weight Lt C D Armstrong Me. Other Ranks were:- Middle-Weight L/Cpl Cox D Coy. Light-Weight Pte Williamson A Coy. The 2nd Battalion in 1923 were having a good hockey season. Of 16 matches played in Regimental Hockey 11 were won, 2 drawn and 3 lost. Goals for were 63 and against were 19. Sporting activities in the First Battalion were disrupted by a move to Khartoum, but not to be thwarted in their efforts the teams for the Egyptian Command Athletic Sports Meeting were left behind to compete. Their efforts and persistence were not in vain. Victories were obtained in the Heavy and MiddleWeights Tugs-of-War, the Relay Race, the 100yds and the Enlisted Boys Race. 2nd places were taken in the High Jump, Long Jump, Hurdles, Half Mile and Three Mile Races. Out of 12 teams competing in the Command Cross Country Race at Abbassia, over a course of about five and half miles, the Battalion obtained 3rd place. The Battalion had five representatives in the Army Boxing Team which met and beat the RAF on February 16th. Three men were selected to go to Alexandria to compete in the Alexandria Amateur Athletics Club's eight mile cross country run on March 18th. There were 79 starters from different clubs and Regiments. Pte Ackroyd B Coy was the first man home in the good time of 45 minutes 30 seconds, Pte Heaver "HQ" and Pte Thain C Coy got 7th and 9th places respectively. The 2nd Battalion in England were having a successful hockey season, being one of the last four teams in the Army Hockey Cup before being beaten by the Durham Light Infantry in the semi-finals 3-2. Of 23 matches played by the team 17 were won, 2 drawn and 4 lost. Chief goal scorers were Sgt Ward 24, Lt Porch 20 and Sgt Nolan 10. In boxing contests Pte Larcombe was showing himself to be an up and coming fighter. He defeated Pte Carter of The Leicestershire Regiment in a six round contest and had already won a Command Individual Medal and had beaten L/Cpl Christie of the Royal Scots on points. As Christie was a candidate for the Army Championships this was no mean feat. Lt Magee, Lt Kennedy, Capt Lunn, Lt Lawton, Lt Doyle, Lt Maurice. Those members who had been left behind in Cairo to compete in the Egyptian Command Athletic Sports Meeting (when the main Battalion moved to Khartoum) justified themselves at the event on April 21st 1923. L/Cpl Cox won the 100 yds in ten and one fifth seconds, time equalling the Army record. Boy Bowles won the 440 yards for enlisted boys in excellent style, his time being only three seconds behind that of the winner of the men's 440 yards. The relay race was won with ease. At Tug-of-War both the Light-Weight and Catch-Weight teams were victorious. In the Command Team Boxing Championship held in Cairo on May 9th the 1st Battalion did well and were unlucky to finally be the losers by one point. An outstanding performer was L/Cpl Major who in each of his 4 bouts knocked out his opponent. (As he was a member of the Band this led to a merry quip in "Regimental News" that the Band had a "Drum Major" and a "one-round Major"). 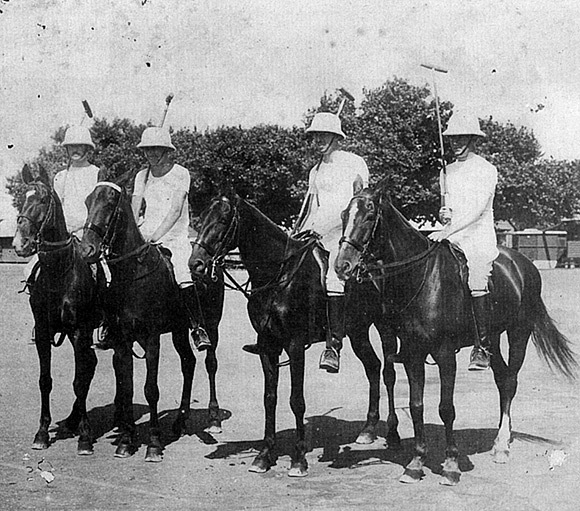 Regimental Polo Team. 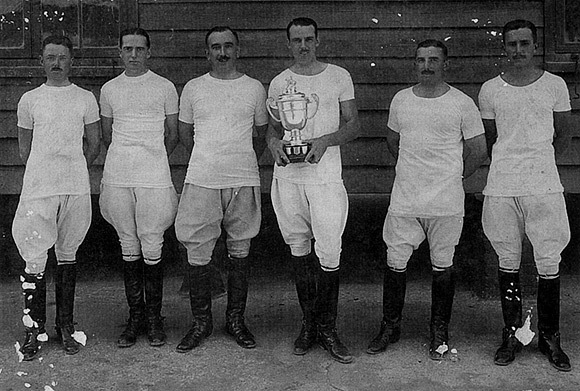 Winners, Gibraltar Garrison Polo Cup 1927-28. The 2nd Battalion in Aldershot held their Annual Athletic Sports on 20th July with a varied programme of events. One in particular interest was the winning of the "Mixed Driving Race" by CQMS Spring and Mrs Stilwell. Presumably it was some sort of carriage event. At the Aldershot Command Horse Show on 28th July the Battalion won the Infantry Transport Challenge Shield for the second year running and obtained 2nd and 3rd prizes for the pair of Mules in GS Wagon or Limber, being beaten only by a pair of mules of the RASC. The Aldershot Command Rifle Meeting in August was a four day event in which the Battalion came 3rd in the aggregate of points. A Company Tug-of-War team distinguished themselves at the Battalion Sports Meeting, apparently "pulling everything and everybody who came on the end of the rope absolutely out of the picture". An aptly named new arrival to the team was Sgt Tugwell, described as being like the "Rock of Gibraltar". Fine weather blessed the Depot Sports Meeting at Aldershot in July. Five motor coaches brought members of 2nd Battalion and their wives to be guests of the Sergeants' Mess. Distinguished visitors included Rev Geary VC and Sgt Curtis VC. The programme included 21 varied events including a "Boat Race"! At Khartoum in the latter part of 1923 the 1st Battalion only had minor inter-Company activities, being adversely affected by such things as inclement weather, bad pitches, drafts home, transfers and sickness. The 1st Battalion were in Hong Kong. At the RCA annual sports meeting on 28th March, at Kowloon the Tug-of-War team defeated the hosts by two short pulls lasting about half a minute each. The Football team, with its season drawing to a close felt they had been reasonably successful. They had secured second place in the Hong Kong League and defeated South China, the crack native team, in the Challenge Shield by two goals to one. The "natives" reversed the score in a later league match. A new venture, in the way of the formation of a tennis club at the Peak was reported in the May 1924 issue of "Regimental News". Stars of the Football Team were named as Eaton, Bristowe, Douglas and William. In the England v Scotland match Eaton scored two goals for England whose own goal was brilliantly defended by Douglas. Both of them played for the Army in the Army v Navy match. 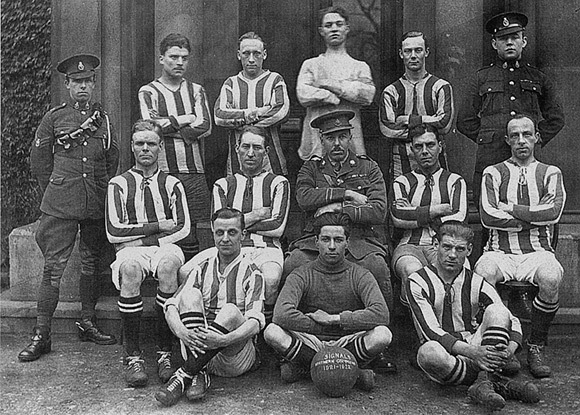 Bristowe had also played for the Army. Adding to his triumphs Eaton also played for the Colony Inter-port team which visited Shanghai. A Company were triumphant at cricket, retaining the Cricket Shield for the third year in succession, but at the Garrison Knock-Out Competition they fell victims to the 83rd Coy RCA by 19 runs. C Company played about a dozen games at hockey and maintained an unbeaten record, drawing two goals all in a match against Red Wing in the Hong Kong Garrison League. The Company Cricket Team was also reasonably successful, reaching the semi-final in the Garrison Competition before being knocked out by a very strong RE Team. Just to show that their four legged friends had the same competitive spirit Pharaoh, the Company No 1 terrier, took a prize at the local dog show. At Tug-of-War the Battalion had a successful year. Two teams viz: Middle-Weight (110 stone) and Heavy-Weight (130 stone) won in the Aldershot Bronze Medal Tournament thus qualifying to compete for the Army, Navy and Air Force Championships at Olympia. Teams defeated by the MiddleWeights were The Black Watch, 19th Battery RFA, The Border Regiment and The Devons Regiment. The Heavy-Weights defeated the Welsh Guards, the Royal Engineers and the Border Regiment. The coach for both teams was Capt C A Clark. There was a marked interest in boxing. Sgt Press's squad wrested the boxing cup from the Cadre Platoon who allegedly had come to look on it as their special property. At the presentation of the Cup and Medals by the CO, Pte Connolly received a silver spoon for making the highest score (94) in the recruits Table A. The hockey performance was good. Of 21 matches played 14 were won, 2 drawn and 5 lost. The 1st Battalion enjoyed a shooting match against the Kowloon Dock on 12th October 1924, winning the event with a Grand Aggregate of 1002. Two successful tennis matches were held between the Officers and Sergeants in September and October 1924 with victory on both occasions going to the former. Congratulations were extended to Colonel Montague-Bates who had always represented the Garrison Tennis Team throughout the summer in the Hong Kong League. The team came out top of the League, suffering only one defeat. At shooting Sgt Dmr French was successful in winning Colonel Ashton's Cup and Battalion Medal for the best Rifle Shot of the WO's and Sgtss. The 2nd Battalion in Jersey competed when the Jersey Boxing Club organised a Boxing Tournament at the Royal Agricultural Hall. The first contest, scheduled to last for six rounds, only lasted for 45 seconds when Cpl Brown knocked out local Light-Weight A Tapley. Of the five Regimental boxers entered 2 won their events, 2 lost and 1 was drawn. At Tug-of-War the 110 and 130 stone teams pulled at Olympia but were beaten in both events by teams from the Royal Engineers, Chatham whose 110 stone team was considered to be the finest in Great Britain. In other contests the Battalion Team were successful, winning the Aldershot Command Championship in three weights - 110, 120 and 130 stone. At the Manor Park Sports they won the Phillips-Garrett Challenge Cup as well as winning the Cup at the Tongham Ground Fete and Sports. Athletics and cricket for the Battalion in 1924 were disappointing, the latter having been affected by bad weather. B Company had successes in Cross Country Running and Shooting Events, winning the Dacca Shield in the former and the Platoon Knock-Out Competition (with Sgt Press's Platoon) in the latter. On an individual level their Company Commander (Maj Minogue) won 1st prize in the Battalion Tennis Tournament held at the Officers' Club on 28th July 1924. Reports from time to time in the Regimental News show various sporting events and social contacts at Hong Kong between the East Surreys and HMS Despatch. Despatch, a "D" Class Cruiser, was to renew her contacts with Surrey Regiments in June 1944 when she was a Headquarters ship off the Normandy beaches and was carrying men of the 4th Queen's as anti-aircraft gunners. On 12th March an Inter-Regimental Boxing Tournament between the 2nd Bn The East Surreys and 2nd Bn The DCLI took place at the Royal Agricultural Hall, Jersey. The Surreys won eight fights out of a total of eleven and local newspapers described the tournament as "the best evening's sport witnessed in Jersey since pre-war days". The Hockey Team had a poor season through lack of competition, there being no other teams on the island. The DCLI, similarly suffering sent over a team for a match which the Surreys won 6-0. When the 1st Battalion departed from Egypt for Khartoum in April 1923 they left behind their representatives competing in the Egyptian Command Athletic Meeting. The results were outstanding - the Battalion winning five first and five second places out of the thirteen events. 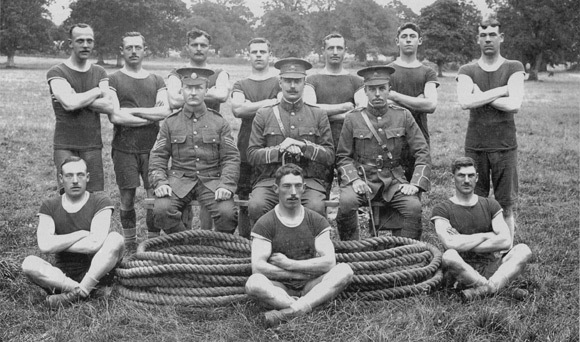 The 2nd Battalion, always "good on the rope", reached the finals of the Army Tug-of-War Championship at Olympia in 1924 with both their 110 and 130 stone teams but lost at both weights to the Royal Engineers. Among other successes it won the King George's Cup, the Royal Irish Cup and the 1st Army Cup in the 1926 ARA. The Jersey Drag Hunt was also in good form, having many successful runs in the season. Far away in Hong Kong the 1st Battalion Boxing Team engaged in a match with the 2nd Bn The King's Own Scottish Borderers and won nine out of ten bouts. They were presented with a nice silver cup by their opponents. At the Rawalpindi District Boxing Championships held from 23rd-25th March, the 1st Battalion were successful in winning the Team Championship, four of the Individual Championships and having three runners-up in the Individuals. At Tug-of-War their 110 stone team won the cup at the Rawalpindi District Military Tournament. Also in the Tournament the football team won the final, beating the Royal Sussex 4-2. Zealous for the Regiment's boxing reputation, the 5th Battalion entered a team for the Brigade Boxing Championship consisting of Ptes Williams and Ladell and Dmr Steel. As a result of his victory Pte Ladell went on to the Divisional Competition, won in his weight, and represented the Battalion in the Territorial Army Boxing Championships where he was beaten on points. Kingston and District League in their forthcoming match against the Balham League. Hockey successes included wins against the Royal Marines, Chatham and the National Physics Laboratory. A successful Annual Sports was held at the Depot on 25th June, when competitors were welcomed from the 21st and 23rd London Regiments and the 5th and 6th Battalions The East Surrey Regiment. A good musical programme was provided by the Band of the 6th Battalion. The Depot retained the Hood Cup although closely challenged by the 6th Battalion. A move from Jersey to Gibraltar curtailed the sporting activities of the 2nd Battalion, particularly as regards hunting when officers' chargers had to be returned to remounts. On arrival at the Rock they found that their polo achievements were adversely affected by the lack of suitable ponies. However, dismounted, the Battalion showed themselves to be in good form at the Garrison Sports Meeting on 14th and 15th June, when they won all the team events except for the 100 yards where they were narrowly defeated by the RA. The artillerymen also triumphed in the final of the Garrison InterCompany Tug-of-War. In a full shooting season for 1927 the Battalion were successful in winning the Queen Victoria Trophy, Infantry Abroad (India excepted). Good results were obtained at the Garrison Rifle Meeting, an outstanding performer being L/Cpl Smith who was the only competitor to score a Pool Bull at 600 yards until ten minutes before the closing hour. In the end he shared the honours with a Gunner, each collecting over £5. The Richmond Detachment of the 6th Battalion took part in a shooting match against the local police in May 1927 and were narrowly defeated, seemingly "coming croppers to the coppers". At Boxing the 23rd London Regiment distinguished themselves by winning the Brigade Championship. 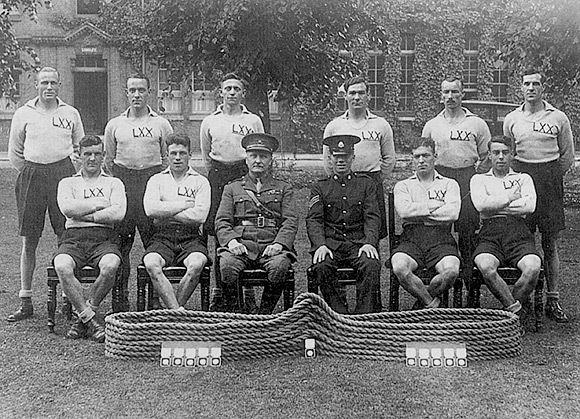 At the same level they won the Brigade Cross Country Cup and for good measure their 110 and 130 stone Tug-of-War teams won the London Territorial Army Championship. Back at Dover the 5th Battalion were delighted to win the Inter Battalion Brigade Rifle Competition, defeating the 5th Queen's to whom they had been runners-up for several years running. Before the year of 1927 was out C Company of the 2nd Battalion at Gibraltar won the long distance race for the Hoare Cup on 17th November, defeating the 1st Fortress Coy RE's by 34 points. B Company came 3rd. The course, a gruelling one, began with a stiff climb up the side of the rock and then, with some very rough going, circling round the old Moorish Castle and down through the town to finish up round the race course at North Front. Outstanding events in India as regards boxing were the Rawalpindi District Team Championships and the Northern Command Tournament. 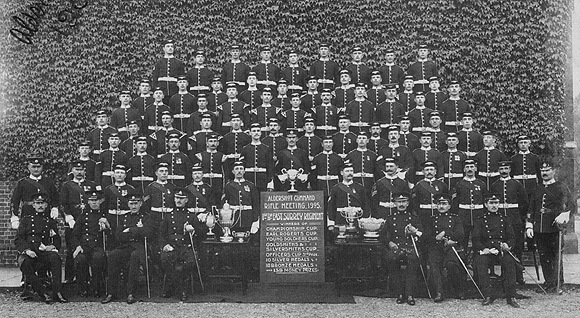 At the former, held on 29th to 31st March the 1st Battalion were successful in winning the Team Championship and securing five of the Individual Championships. 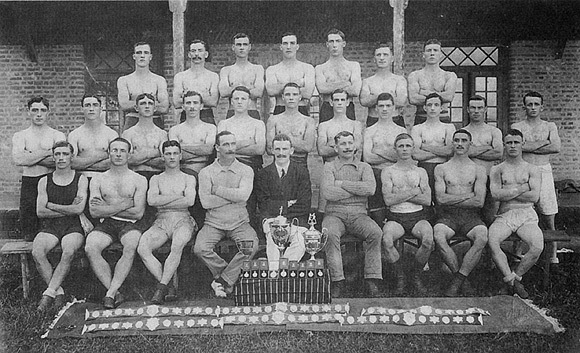 The latter event was not quite so successful but against strong opposition from the Seaforth Highlanders the Battalion won one fight in the Team Championship and had one runner-up in the Individual Championships. For the second year in succession the Battalion 110 stone Tug-of-War team won the Rawalpindi District Tournament Cup. 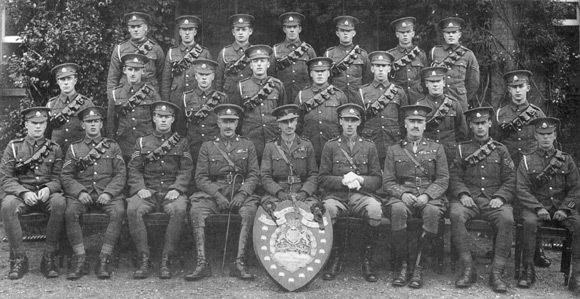 Maintaining their shooting reputation at Gibraltar, the 2nd Battalion obtained several successes at both Battalion and Garrison rifle meetings, the most outstanding being that of Pte Driver who won both the Battalion and Garrison Cups. 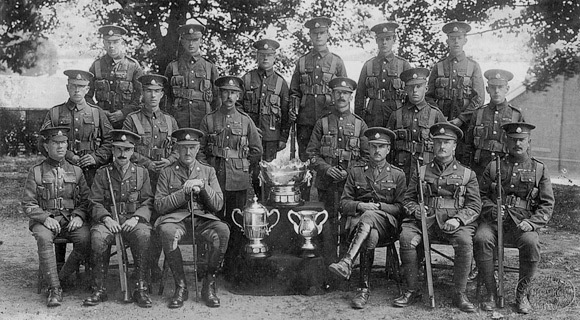 The First Surrey Rifles decided to "go public" with their various cups, trophies and photographs and displayed them in a shop at Herne Hill rented for recruiting purposes. The Battalion took second place in bayonet fighting at the London Territorial Association Championships, being beaten by the Artists Rifles "A" team after a hard fight. Indian weather intervened forcibly at the second part of the 1st Battalion, Athletic Meeting at Rawalpindi. A violent dust storm blew up but the competition pressed on to make the meeting as successful as possible. The 2nd Battalion left Gibraltar on 10th May with the good wishes of the Governor, Service Units and residents of the Rock and a highly complimentary letter from the Governor to the Commanding Officer. Their destination was Catterick where there was initially little to report in the sporting line mainly due to lack of time for training. But later in the year they were getting into their stride (literally)when they won the Cup in the 13th Infantry Brigade Sports on 2nd August 1929. Winning the half-mile relay by 180 yards, they also had the first four men home in the Mile as well as having several men among the leaders in the Three Mile. Good results were obtained in the Weight, Discus, Hammer and Javelin events. Congratulations were due to L/Sgt Blackman who obtained his Army Colours for the mile in the summer in his last year of service. Successful at work as well as at play they also won the Northern Command Machine Gun Fire Control Cup. The Depot were putting in some concentrated boxing training in early December, in preparation for meeting the 6th Battalion later on. Contests took place at various weights. The match took place on 14th December when the training paid off and the Depot won by 28 points to 17.